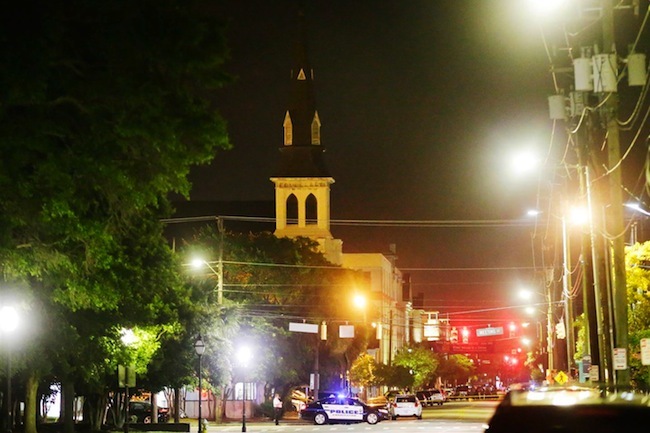 The domestic terrorism unleashed at Emanuel African Methodist Episcopal Church (Mother Emanuel) last night in Charleston, South Carolina, “the Holy City,” starkly displays the hypocrisy of U.S. Christianity. According to the Pew Research Center, 70.6% of U.S. citizens identify as Christian. If in fact, nearly two-thirds of the people of this country who purport to be disciples of Jesus Christ, the Messiah, stood for LOVE there is no way in hell that the murder and oppression of African Americans would be anywhere near acceptable and well-tolerated. Neither would the practice of White Supremacy and its systemic implications. Mentally ill or not, Dylann Storm Roof, the shooter, was no doubt bolstered and made brazen by hatred. A core element of the ideology of white supremacy is manufacturing animosity against an entire group—people of African descent—which is exceedingly illogical and immoral. Where is the Church’s moral outrage regarding the attacks against Americans of African descent? Where is the Church’s righteous indignation? Where are the Church’s prophets, priests, and servant leaders of every ethnicity decrying the murders of innocent people of a darker hue? Why is not every congregation exercising civil disobedience and political power to end what seems to be open season on African Americans? Why has there not been an overwhelming demand that justice roll down like thunder as called forth by the Prophet Amos? All of these actions should have taken place long before nine precious souls, including Pastor and State Senator Clementa Pinckney, made their transitions from labor to reward—sadly at the hands of a gunman perpetrating a hate crime. As a Christian, you cannot be anything but a hypocrite, which God despises, if you are not wholly invested in social justice, love, charity, and righteousness. If in fact our country were Christian in character, we would care for everyone. We would ensure justice for everyone. We would value and affirm everyone, educate everyone, and ensure social dynamics that would allow everyone to thrive without prejudice, bias, and the specter of police brutality and mass incarceration (God bless the soul of Kalief Browder). This pretty picture of caring, compassion, and provision that I just painted is what love looks like. Love is not callous, indifferent, silent, cruel, unjust, tyrannical, despotic, or repressive. But racism, bigotry, prejudice, xenophobia, oppression, and relative practices are. These vile, petty things are incompatible with the Gospel of Jesus Christ. If you cannot love your sisters and brothers—your fellow members of the human race—who you can see, you cannot love the God, whom you cannot see. This is the word of God found in 1 John 4:20. Such would represent spiritual, theological, philosophical, intellectual, and social dissonance. In a word: hypocrisy. For a point of emphasis let me note, the historical Jesus Christ was a Northeast African Palestinian Jew. Therefore, he was not one of pale skin, with blond hair or blue eyes. Want to talk about cultural appropriation? Talk about representations of Jesus, the man, as possessing a European phenotype. If that is your Jesus, you are as misinformed about Jesus’s ethnicity as Rachel Dolezal is about her own ethnicity and heritage. In Mark 8:29 (and Matthew 16:15), Jesus asks his disciples, “Who do you say that I am?” That question still has resonance today. Reza Aslan, scholar and author, asserts that it is okay to envision and appropriate Christ as reflective of one’s own ethnicity. Possibly, but the Revelation of St. John describes Jesus, the Risen Savior, as having feet of burnt bronze and white wooly hair. Even so, to assert that the historical Jesus, the embodiment of your supposed Savior, is anything but a Northeast African Palestinian Jew and of dark skin, you are wrong. Should you hold on to this mischaracterization of Jesus you would become a liar, and again, a hypocrite. Why is the historical Jesus’s ethnicity important? Because this is the physical personhood of the transcendental Being you purport to adore, worship, and hold sacred. How can this be when you despise black bodies? How can this be if you deny who Jesus really was? How can this be when you do not love black people? Europe knows that Jesus was an African and even venerates the Black Madonna to this day. Add yet another layer to U.S. hypocrisy. Without question, the failure of the 21st century Church to rise up in mass against the contemporary rash of police brutality and manifest xenophobia and oppression against African Americans is beyond problematic. It is sinful. I must ask, how is the murder of the bible study attendees at Mother Emmanuel at the hands of a hate-based terrorist any different from the murders of unarmed, innocent African American women, children, and men at the hands of wanton law enforcement officers who have annihilated lives, and violated citizens’ human and legal rights? Context of course, yet, the value of each life lost is unequivocally equal: each is invaluable. Black Lives Matter, perhaps none more that Jesus Christ who bore the sins of the world. An appreciation of Jesus in his Africanness holds the liberative opportunity that racists, bigots, xenophobes, and white supremacists so desperately need. This fallacious notion of a white embodied deity has supported the enterprise of the ideology of white supremacy to humanity’s detriment. It has created the type of psychosis that has bred cold-blooded hatred of African peoples worldwide. To see Jesus as his African self can help whites that have been socialized to fear and hate people of African descent. Jesus, the Northeast African Palestinian Jew could help dispel the sociopathology that has been imposed on some white people. This denigrating psychological and intellectual mindset has put African Americans at grave risk of danger yet again in America, the supposed Sweet Land of Liberty. Christians must stand on the proclamation that #BlackLivesMatter or else your religion is indeed lost, even dead. Apathy and hypocrisy have killed it.